I came across this awesome VW and was very jealous of it. Not that I'd actually want to drive such an old car and all the inevitable problems that came with it, but I like the idea of this car in theory. It looked so cool there in the early Sunday sun. Plus it's orange, so natually it greatly appealed to me. My plan for this run was to stay exclusively in Wash Park for nearly the entire run, and it was such a beautiful day in the park that I managed to wind my way around the enormous park a few times and call it a run. Usually, I like to have more of a destination in mind, but this run just felt like it needed to stay in the park. My speeds were faster than normal, because as always, when I run around a lot of other runners, I usually try to run faster for whatever reason. 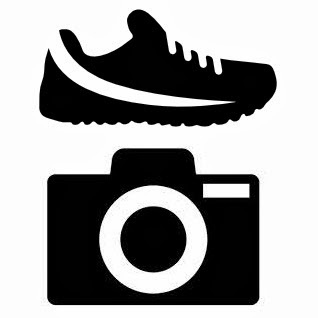 And Wash Park is home to a LOT of runners. I was passed by several girls on this run, so my ego is well in check. I am not a super fast guy, no matter how much I wish I were. It's good to remember that by getting passed in a park by a bunch of people. Even though I can't keep up with them, just being around other runners gets me going a little quicker, and I like the encouragment to push myself. Fresh from an amazing finish at the World Cup between Greece and Ivory Coast, I was feeling pretty exhilarated as I started off. This feeling was magnified by the glorious clouds which had caused the temperatures to dip 20 degrees from where they have been lately. It felt great to get going, but just like the Ivory Coast's chances to advance, my cool temps vanished in a flash. About 2 miles into the run the cloud cover quickly burned off, and suddenly the sun was pounding down on me with white hot intensity. 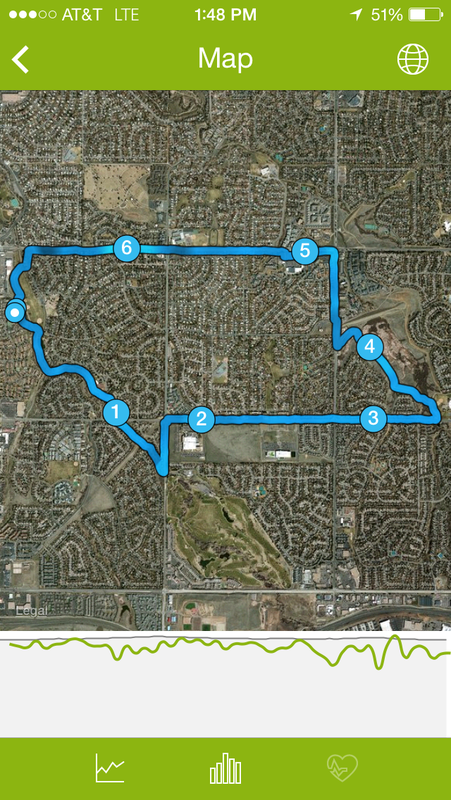 Summer sun drains you quick, and I quickly realized this would be a shorter run. I realize how far I've come with running when I feel like a slacker if I don't at least get six miles in. No matter, a few miles from home I was getting sweaty, hot, and desperately in need of a break. So I dipped into the Goodson Rec Center to buy a frozen fruit bar because I was craving the sweet combo of cool and delicious. As I walked out, I saw my friend Kelly chatting with a friend. I said hi, and she surprisedly said, "You're eating a popsicle!" as if such a thing were highly unusual. I just replied with a self-satisfied, "Yup!" She said when she was a kid pretty much everyone as a kid dreamed that some day they would grow up and be able to buy themselves a popsicle. "I guess I've succeeded at being a grown-up!" were my final words to her as I turned to finish up my coconut fruit bar and then my run. I truly felt like my childhood self would be well pleased with my decision making, so I ran home with a sweaty smile on my face. As for today's photo..."From the backyard that brought you "Whimsical Dragon" and "Funky Jaguar on the Shed Roof" comes the latest goofy backyard accessory..."Gorilla Flanked by Lighthouses". I love this person, and hope that whoever they are, they continue to fill their yard with ridiculous sculptures, because this type of eccentricity is the backbone of Run and Shoot. Soundtrack: The Shins "Oh Inverted World" and "Port of Morrow" and "Wincing the Night Away"
Gay people are doing their best to keep me from getting fat. I'm not prepared to call it a conspiracy since I'm pretty sure that the people organizing Denver Pridefest were not considering my caloric intake when they planned their parade. Yet, that darn parade kept me from hitting up Voo Doo Doughnuts at the end of my run. My run had actually been pretty great. 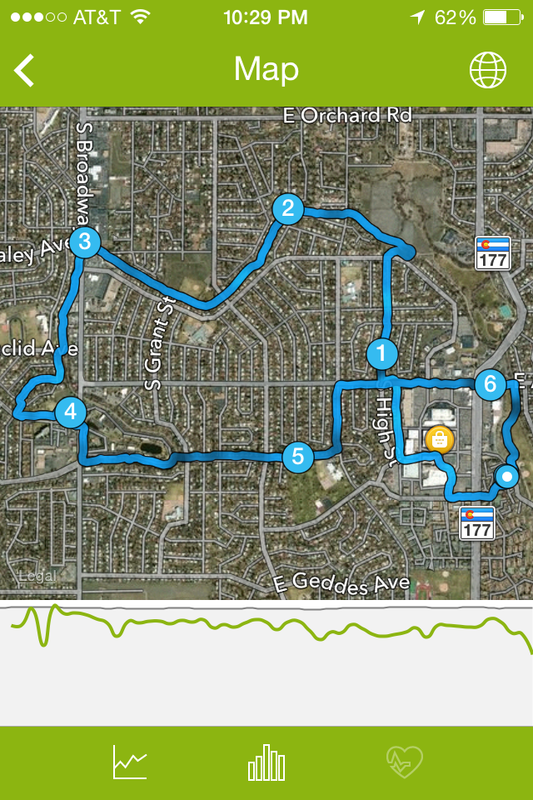 I had started in City Park and run through a good portion of downtown, and my plan was to run back towards the park via Colfax. As I turned on to Colfax, I immediately realized that I may need to adjust my plan. The gay pride parade was working it's way down Colfax. I had to admit, I was curious to see what was going on, as it wasn't the sort of thing I have much experience with. They sure looked like they were having fun. Lots of loud music, silly dancing, and rainbows everywhere. I was trying to run up Colfax on the North side of the street while also checking out the parade. This was not going to work, though. There were way too many people and way too little sidewalk. After about two blocks where I basically had to abandon running and just push my way through crowds of beautiful men and frumpy women, I decided I was going to go up to 16th St and run back that way. Voo Doo was on the wrong side of the street for me, and there were way too many people, so I had to abandon my doughnut plan and just run back to the car. So I have now at least briefly attended a gay pride parade...so that's something. I'd rather have had a Bacon Maple Bar, though. Soundtrack: Passenger "All the Little Lights" / Lupe Fiasco "Lasers"
Everything was perfect. The weather was gorgeous, the temps were completely perfect, it's the kind of night I'd order up to go running. The only problem was that I was working with only four hours of sleep and my legs were dead from Thursday's run. I wanted to go on a long run, but my body was telling me "No!". I was arguing with myself the entire run. I kept trying to talk myself into going further, but my lungs and legs provided a convincing counter argument to cut it short, which I eventually did. Such a pity, as you can see from the photo, it was a beautiful night. This picture is one of my favorite views...it's one of the few places very near my house where you can get views of the mountains without powerlines in the way. When I see this view, I know I've just about finished up my run, and I just enjoy the beauty. This stretch of road is great to look at in almost any time of year. I was running down Mineral, and I saw something one hardly ever sees...A dead bird just lying in the gutter. It looked so black and peaceful. It didn't appear to have suffered any violent trauma, it just looked like it was fine one second and dropped dead the next. No signs of suffering or a fight. Honestly, I could almost be talked into believing that it was just having a little nap in the street if I didn't instinctually know that such an action is utterly unbirdlike behavior. Seeing that dead thing just lying there, my natural reaction wasn't empathy or sadness...it was curiousity. How did it die? What kind of bird was it? It almost seemed like it could be a crow, but it looked a little small for that. No answers were to be found, just a dead animal lying there. So weird. Animals usually find private out of the way places to die, they don't tend to be found this intact on the side of a busy street. I took a picture of it because of course I took a picture of it. Such a strange thing to see. Mood: Confused by an aggressively friendly gas station attendant. I had run nearly five miles and I was stopping in to the Shell station seen in the background of today's photo. I walked back to the beverage section and perused the selection of drinks trying to make a selection when it began. I was listening to my podcast, and the guy who worked at the gas station greeted me loudly and asked how I was. I causally told him that I was good, and intended to keep looking at the beverages, but he was so intensely speaking with me that I thought he may have been imparting some very important piece of knowledge like perhaps the building was on fire or maybe he had the secret to unlock the fountain of youth or something. I yanked the headphone cord out of my phone so that I could glean the knowledge he was trying to passionately trying impart. I caught him in mid sentence as he was excitedly rambling about how he wished more people would say they were good instead of just saying that they "Weren't bad." Apparently saying, "Not bad" is a character flaw. "I like you, If you're doing good, just say you're good. You have the right attitude, man!" He went on to praise me about sixteen different ways, tried to sell me a Shell Credit Card, and then got really excited and proud when he found out I was out on a run. He then noticed my Bronco t-shirt and hat and asked, "So, you're a Bronco fan, huh?" Clearly, nothing could escape his massive powers of deduction, so I didn't try to lead him astray. He told me how he was from Texas and a Cowboys fan, but that he liked Broncos fans. Then I made a mistake. I told him I went to the Super Bowl back in February. I had already paid for my Powerade at this point, so I slowly backed away from the door as he excitedly took in this news of my experience. He awkwardly gave me a high five, and I think if I had stayed a minute more he'd have asked for my number. He was really excited about the fact that I went to a Super Bowl. I told him good night, and then bemusedly walked out the door to drink my beverage before finishing up the run. He seemed like a good dude, but I have to think there was some kind of drug induced mania going on during that interaction because that dude was INTENSE. I'm a little afraid to ever go into that Shell again. As for the picture...in addition to capturing my new best friend's Shell station, I also captured a pun! Cool-n-Fresh Flowers loves word play, and oh boy do they have jokes. So many jokes, I wet my plants. It's amazing how much more differently I see the world when looking for good pictures at night. You'd think the options would be limited, but I see so many things I'd never see during the day. 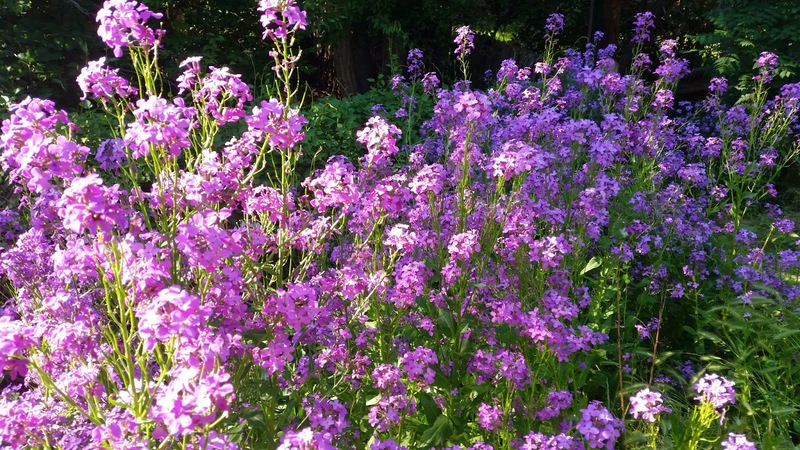 It opens up new things to see being limited by lack of daylight. I still have more options when it's daylight, naturally, but the night time causes certain things to come to the forefront that I might have otherwise missed. My friend and "odd thing" advance scout Deb told me that I needed to hit up the corner of Forresthill and Powers in Littleton. I'm glad she did, because Sunday morning I decided to make the trek out to that part of town on my run to check out this monstrocity. I think it's supposed to be a Native American, but it's wearing sunglasses around it's neck, so I was thrown off. He appears to be holding an eagle and a tiny golf club and is flanked by wings rising from the ground. He also appears to be growing buffalo horns and his muscles are nothing short of disturbing. Basically, he is everything I look for in a weird item to see on my run...so thanks Deb! This run began at 5:45 in the morning out of necessity. 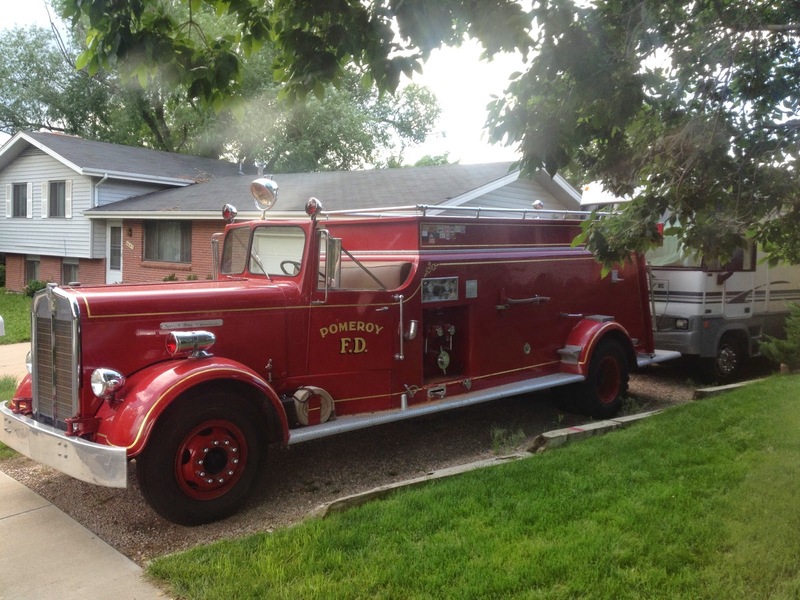 My son Luke and I were planning on meeting my oldest friend Doug and his daughter Sammy and heading to Denver Comic Con that morning, so if I was going to run, it had to be early. Getting up that early made for a rather chilly start, but seeing as I have been sweating through ungodly heat lately, a little chill was welcome. This run was a bit longer that I have been going lately, and I was starting to drag a bit at the six mile mark until some runners appeared a bit ahead of me. They were going just a tiny bit slower than I was wanting to go, so they basically gave me a rabbit to chase down. Having someone pace you is a godsend, and it kept me from slacking at all and it brought me through the home stretch at a terrific pace. Nothing like a tiny bit of motivation (in this case being determined to catch and pass these two) to keep one going. I am happy to say that I did catch up to them, said hello, and then passed them as I left the trail. If there was any doubt just how much running has taken over my priorities, I went out for this run last night as Game 5 of the Stanley Cup Finals was headed to overtime. I was hoping that someone would score to break up the tie in the 3rd period...preferably the Rangers. However, once it went to OT, I decided I needed to get my run in even if the Stanley Cup was potentially going to be handed out while I was gone. The run itself was lovely, even if I was a bit slow. I really enjoy night running. The moon was rising in the east as I started out, and it looked enormous. I got this photo of it which I really liked, but still doesn't fully show how big the moon looked. I'm always a little disappointed in pictures of the moon, but I really shouldn't expect an iPhone camera to capture something like a magnificent moon as well as the human eye experiences it. I kept checking the ESPN app as I ran to check in on the hockey game, and the overtime just kept going. The first OT ended, and then as the second one started and kept going deeper, I began to think that I might actually get a chance to see the ending. Then, as I was about five minutes away from getting home, I had a terrible sinking feeling...it was as if I were Obiwan Kenobi sitting in the Millennium Falcon when suddenly he felt a disturbance in the force when Alderaan was destroyed. I felt as if millions of Rangers fans suddenly cried out in terror and were suddenly silenced. I knew something terrible had happened. I knew the Kings had won the Cup. Granted, it's not that terrible...as I'm not really a fan of either team, but I was definitely rooting for New York. The weirdest thing to me was how accurate my gut was. I had just checked the score a minute prior, and suddenly I knew that the game was over and that the team I didn't want to win had won. And I was right. That was bizarre to me. I had no doubt either...I KNEW it was over. Got a later start on this run due to family schedules and summer heat, but I discovered that early evening is a pretty swell time to go running. The dusk light makes everything beautiful, but not nearly as hot. It helped that the sky was a brilliant blue with puffy blue clouds. I was in a solid mood. The NBA Finals were taking place as I ran, it was Game 4, and the Spurs have pretty much put a steak through LeBron's heart at this point, just crushing the Heat. I was hoping that the first half would be played to a draw and I'd get back from my run in time to see a hotly contested finish. Sadly, it was a blowout. Although, It made me happy that I decided to go out running since I clearly didn't miss out on much while I was gone. I got several cool pictures on this run, but this dragon was lit up by the waning sun, and it just looked magical. As soon as I saw it, I knew it'd be the picture for today. One might start thinking I really love dragons, as I posted a dragon picture for Post 91 just a month ago. I can take or leave the mythological creatures, but chances are good that if you put one in your yard, I'm going to snap a shot of it. I think that road signs are supposed to be pretty uniform, but then I come across something like this that I have never seen before and I begin to doubt their uniformity. 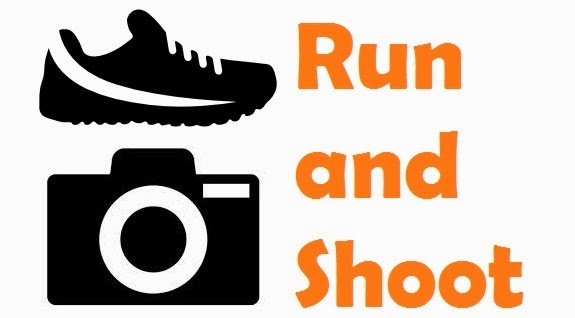 I saw this sign as I was driving home, and I instantly knew what I wanted to take a photo of for today's run. 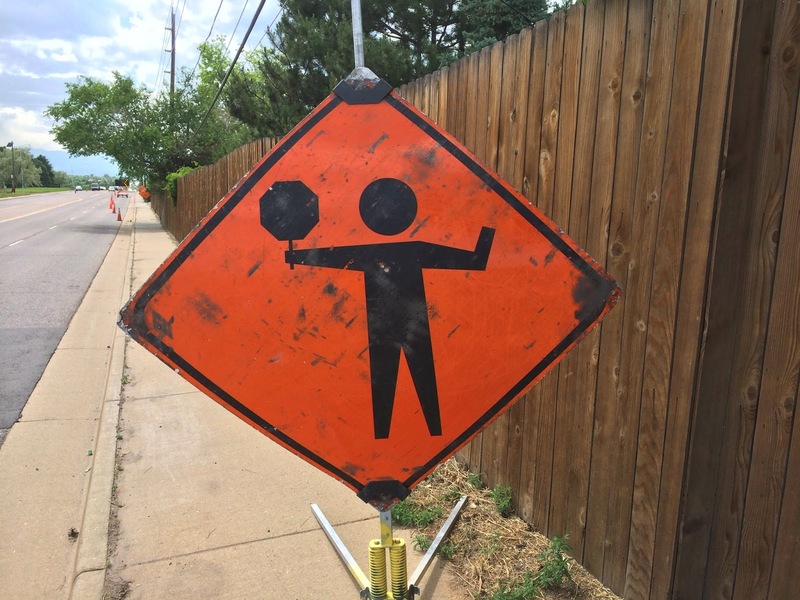 The first thing that popped into my head was, "Caution: Ping Pong Ahead!" I think we should have more road signs that are individualized for situations and have nothing in the way of general road uniformity. I think that the people who hold the slow signs would really let their creative energy flow and we'd come up with all sorts of fantastic new things to see. The one problem might be that there would certainly be a marked increase in profane signage, but you have to take the good with the bad. 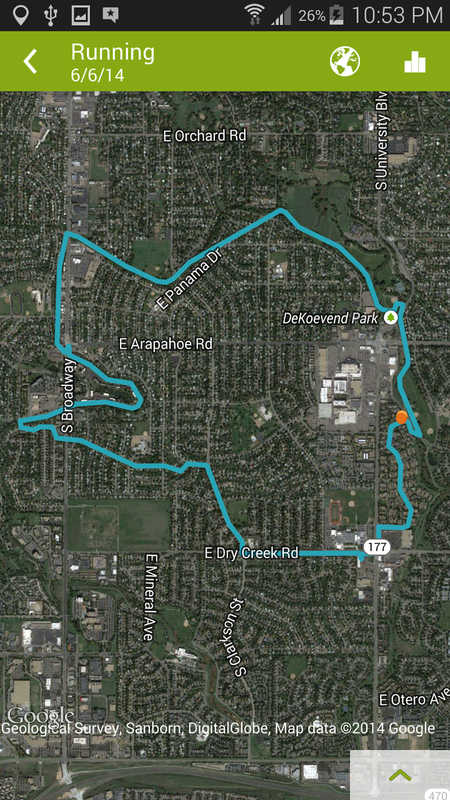 I had hope that this run wouldn't reduce me to a hulking sweaty mass, as although the temps were over 80 degrees when I left...there were signs of cloud cover being imminent and potentially even a late Colorado Spring rain. Sadly, neither of these things ever developed in the area I was running in, and by the time I was halfway through the run I was getting pretty sapped from the sun and the heat. Beyond the amusement of my ping pong sign, I didn't see anything all that interesting on this run. Although this outing was pretty dull as far as anecdotes go, it was comforting and familiar because I had ditched my Samsung phone on Monday for a good old iPhone. There was nothing wrong with the Samsung, it's a good piece of tech, it's just not the phone for me. I enjoyed my run with a phone that felt as comfy as an old shoe and was kind of glad to be back in the Apple fold while running. City Park is quickly becoming one of my favorite places to start a run. 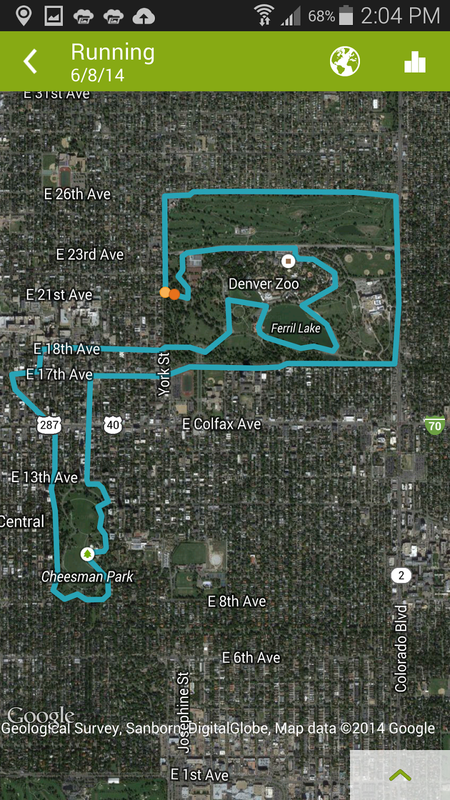 I began smack dab in it's middle, ran north around the public golf course, headed to Cheesman Park, and then headed back to the car taking a meandering route throughout City Park. On my way I saw multiple dogs pooping in parks (and taking their sweet time to do so, by the way), I saw a man with hair that looked like a coonskin cap that Davy Crockett would be proud to sport, I saw a whole family dressed up from head to toe like ladybugs, and I saw two apartment buildings that were quite unusual. One of the apartment buildings was called "Rocket" and it featured all sorts of futuristic for the 1950's rockets and the other building was called "Aperature" and featured a mail room entryway with walls that were littered with old school cameras and a giant old school movie camera statue out front. Some building manager is having their buildings stand apart a bit because of cool art direction...something you don't tend to experience in apartment buildings all that much. 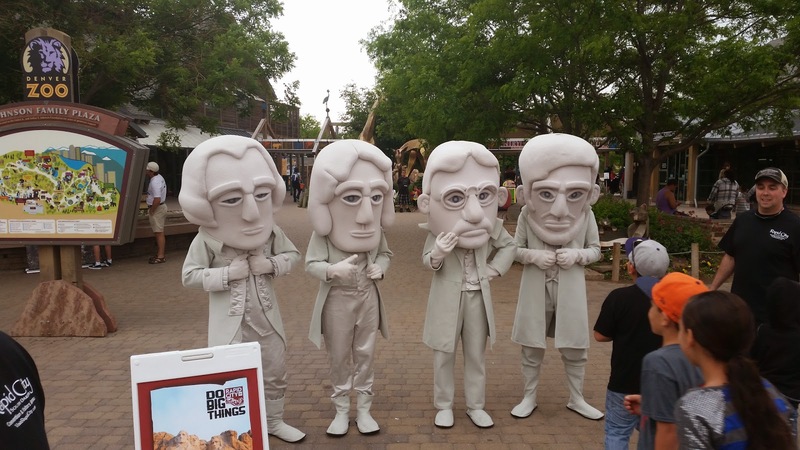 Then, of course, as I was almost finished with my run, I met the four Rushmore presidents in front of the Denver Zoo. Sunday runs slightly away from home are always the best, especially when I get to experience so much oddness as I did today. I took my run just in time, because in the final 15 minutes of the run, the weather went from lovely to gray and overcast with ominous rain clouds that dumped rain on the Denver area for the rest of the day. The storm rolled in with dramatic quickness, and even caused the Rockies game to end in six innings and yielded yet another Rockies loss...as the Rox are falling apart almost as quickly as the Broncos did in the Super Bowl. I still have another week and a half or so to be able to trade in this phone for a new iPhone if I so choose, but thus far, I think I'm happy with the phone. Learning new things is hard, but it's probably good for you...or so I keep telling myself. At least it appears that if nothing else, this phone is a champ when it comes to running. I had fully intended to begin this run at Cheesman Park and see where it led me, but as I was driving up Downing Street, I noticed the lovely running path alongside the Platte River which divides the two directions of Speer Blvd. I quickly decided that I must run on that path and stopped almost immediately on Downing and 3rd. As I ran along the Platte, I was struck by just how many bikers and runners were using this path. This stretch rivals the volume of Wash Park, which I would never have thought possible. I also saw a good number of homeless people sleeping under the bridges, completely disregarding the signs posted everywhere which state "No Camping". I think the homeless are actually following the rules to the letter of the law, as "camping" implies that you are sleeping outdoors because you want to, not because you have to. As I ran down this path, I noticed that I was passing the King Soopers at Speer and 13th. I have always wanted to shop at this grocery store since I was a little boy, because it has a two story parking garage which obscures it, which I always thought, even as a kid, was just extremely weird. I have never had a reason to stop into that particular store as I've been driving down Speer, as I'm usually on my way downtown, but today was my chance. I walked into the weird parking structure and walked into the middle of what felt like every other King Soopers I have ever shopped in. (Except for a much larger selection of questionable downtown people with a lovely excess of wild tattoos and general scuzzyness.) and It's odd how a grocery story can make you feel at home, but I feel quite at home in a King Soopers. It feels like the suburbs, which was odd as I was so close to downtown. The jarring oddness of walking out of the store and immediately going from suburb feel to downtown feel shook me a bit. I decided to leave the path at Colfax and make a pilgrimage to Sports Authority Field at Mile High. There were a surprising number of people walking around like tourists and taking photos. I joined their number, and took a few pictures myself. I also waved hello to the two other joggers who were running around the stadium and also running the steps. I get a funny feeling of Bronco pride whenever I am near that stadium. I really like it, and even though we are months away from any meaningful football, I still get excited whenever I get near it. At one point, as I was running around the West side of the stadium, I was all by myself, and I could see my reflection in about 12 of the stadium's windows on the facade. I was wearing a Bronco hat and dri-fit running shirt, so I was quite orange in the reflection. That was a pretty cool moment. Not much else happened on the run, except that as I was running down sixth avenue, I passed a tiny building with a cool mural on the side that read, "Indie Six". I had no clue what it meant, but as I passed the front of the building, there was another side that said "Indie Six" so I assumed that was the name of the business. I looked in, but had absolutely no clue what kind of business it could be. I was shot the most disdainful look by the woman at the front desk, though. She made me feel in two seconds just how much better she thought she was than me. I didn't care for her much, even though I thought the little building was pretty cool. I Googled the place when I got back home, and it turns out it a hair salon. Perhaps she could tell just how bald I am under my hat, and that was why she gave me that look of smug superiority. Perhaps I'm just too sensitive and reading something into a look that wasn't there, too. That could always be. Even getting rained on throughout a decent portion of this run couldn't pep me up. Usually when it rains, it gives me an extra gear. This run I just got wet. Kinda dragged myself through the paces this run. I was looking forward to a night on the town with my lovely wife to celebrate our 14th anniversary at the Chophouse...which is maybe my favorite restaurant on the planet. So I was in a terrific mood even if my running enthusiasm was sub par for this run. If I got nothing else of value from this run, I was able to see this Star Wars plastered vehicle with a vanity license plate of "Bantha" which I believe can only mean one thing...this dude is beating the ladies off with a stick. Although you have to admire someone who personalizes his vehicle due to his love of the steeds of Sand People. I gotta imagine I'm going to run into this guy at Comic Con in a few weeks. Don't get me wrong, I love this guy...even though I've never met him.